Our best childhood memories include horsing around in the colorful and durable back seats of hadron collider-sized rolling Americana. 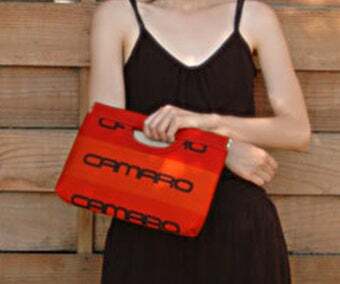 Kim White remembers them with fondness as well, offering these amazing handbags sewn from the same vintage automotive fabrics. Thankfully seating materials have been updated over the years, giving our hind quarters somewhat of a break as well as freeing up fabric for White to turn into fantastic clutches. Take a peak at the most stylish of the bunch, the Camaro Special Edition ($225) and try to picture your favorite lady friend gasping it tightly at the next vintage car show you both attend. dead stock never-used textiles intended for use in American automobiles: cars, trucks and vans. She fortuitously unearthed an entire warehouse of automotive fabric, which may be the last existing stock anywhere in the US, and she is the sole owner of these amazing textiles. A reason to impress her has never come sooner, so gents, get your credit cards out and make your girl happy.